With Murky Water And Manatee Death, Florida Lagoon Languishes Florida's Indian River lagoon is a rich estuary, home to dolphins, manatees and turtles. But in recent months, it has become clear that something is wrong. Scientists and government officials blame water discharges from Lake Okeechobee and an upswing in pollution. Florida has gotten a lot of rain this year. While that's good in some ways, for the lagoon it spells trouble. As Lake Okeechobee has risen, water managers have diverted much of the excess flow down canals, taking it West to the Gulf of Mexico — and east to the Atlantic. Dennis Hanisak of the Harbor Branch Oceanographic Institute in Fort Pierce uses a small pontoon boat to check on a network of monitors that keep track of the lagoon's vital signs — temperature, pH, salinity, oxygen levels and other factors like turbidity and water color. Biologists Laura Herren and Brian Lapointe bag red sea grass at Shorty's Pocket, a site in the Indian River lagoon. Manatees have died from eating the toxic macro algae. Along the lower end of the Indian River, Hanisak says, the lagoon is looking sick. "This year with the Lake Okeechobee discharges," he says, "we see very low salinities, we see very high nutrients. We see very high water color. We see high turbidity." The fresh water lowers the salinity in the lagoon and carries silt and other solids that make the water murky. Perhaps most critically, water from Lake Okeechobee carries high levels of nitrogen and phosphorus, pollutants that Hanisak says have had a big impact. "We have reached a tipping point in the Indian River lagoon now," says Brian Lapointe, a research professor at Harbor Branch who has investigated the algal blooms and the death of marine mammals in the lagoon. In the past year, more than 60 dolphins and 120 manatees have died. At least with the manatee deaths, he says, the cause is clear. As sea grass has died, Lapointe says, manatees have turned to eating a type of macro algae, a red seaweed that has become toxic with the lagoon's changing chemistry. "This is what they're left with to eat. And they're eating a lot of this — 40, 50 pounds a day or more," he says. 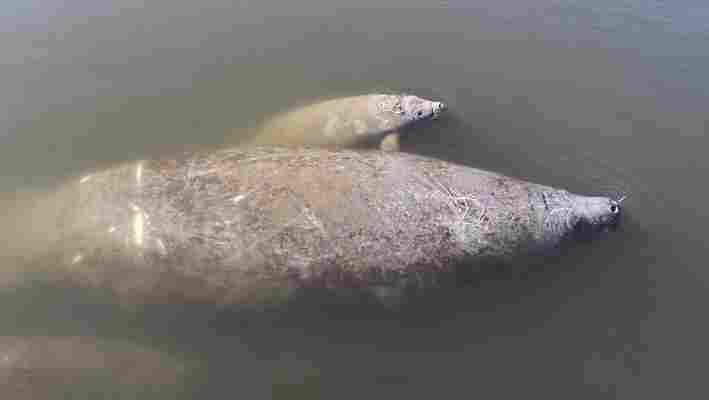 The algae blooms, along with the manatee and dolphin deaths, have led many in Florida — including politicians — to declare a crisis. Florida's Senate formed a select committee to search for answers. "We are past the time for talking and power points and deliberations. We are here to find some short-term solutions to the current environmental crisis," said Sen. Joe Negron, who chaired a recent hearing in Stuart, a town on the St. Lucie estuary. Speaker after speaker told the committee that there are no short-term solutions. The Army Corps of Engineers, which maintains the levees and water level in Lake Okeechobee, says releases of polluted water from the lake are unavoidable. Because of all the rain, they're necessary to avoid a possible catastrophic breach of the lake's levees. The only real answer, scientists say, is to stop draining Lake Okeechobee into the Indian River lagoon and restore its natural flow through the Everglades to the south. That's a long-term solution still many years and billions of dollars away. But stopping the water releases from the lake would still address only part of the problem in the lagoon. A larger issue — one that may be even harder to deal with — is septic systems. In three counties on the lagoon, Lapointe told the committee, there are 237,000 septic tanks. "Do the math. Over 1 million kilograms of nitrogen a year are going toward the Indian River lagoon from septic tanks alone," he said. Crisis or not, there's little political will in Florida to begin requiring communities to move residents off septic tanks. In his 40 years of work on the Indian River lagoon, Lapointe has seen similar crises come and go. A few years of drought may ease the algae blooms. Politicians may lose interest. But, he says, if the lagoon's health has indeed reached a tipping point, the way that communities and elected officials react this time will have long-term consequences for the river.